The West Indies has a long, rich heritage in producing some of the world’s most sought-after chocolate, and the island destination of Saint Lucia is now sharing that experience with visitors during Chocolate Heritage Month this August. Throughout the month, visitors can celebrate chocolate and its roots in the cocoa bean through plantation tours, exclusive chocolate-inspired spa treatments, specialty menus and more. Island-wide hotel and resort offers for couples and families feature savings from 50 percent on room rates to chocolate tastings menus, indulgent spa treatments and more. Saint Lucia’s chocolate legacy dates back to the thriving cocoa industry of the 1700’s. The island’s chocolate making process has hardly changed since the original chocolate boom, solidifying Saint Lucia’s reputation as a top quality cocoa producer. Hotels and resorts are now tapping into Saint Lucia’s rich heritage to create inventive chocolate services and amenities as well as hands-on agritourism experiences for visitors. Specialized plantation tours such as the Chocolate Decadence Tour by Island Routes Tours takes guests on a luxury catamaran from Castries port to Rabot Estate at Hotel Chocolat for an all-day tour that includes chocolate making from scratch, and a chocolate-infused gourmet meal followed by a leisurely afternoon at the Sulphur Springs’ mud bath. The Fond Doux Holiday Plantation tour leads guests through the cocoa fermentation house where visitors can participate in the traditional “cocoa- rina” dance to polish the cocoa beans. Additional plantation tours are available at a variety of locations including the Marquis Estate, Anse Mamin Plantation, Emerald Estate, Morne Coubaril Estate and La Dauphine Estate. Not just a dessert, dark chocolate has a number of wellness benefits attributed to it, from a healthier heart to sharper focus and lower anxiety. It also boosts blood circulation to the fine capillaries enabling skin to draw oxygen and nutrients that protect skin against dehydration, making cocoa an ideal spa infusion. Many of Saint Lucia’s top resort spas and restaurants use native cocoa to create inspired savory and sweet dishes and spa treatments that are both indulgent and healthful. Chocoholics interested in planning a chocolate-inspired trip filled with Saint Lucia’s cocoa delights can visit Saint Lucia’s Chocolate Heritage Trail map at https://www.facebook.com/SaintLuciaTouristBoard, which highlights the island’s sweet spots, including history, key sites and special offers. 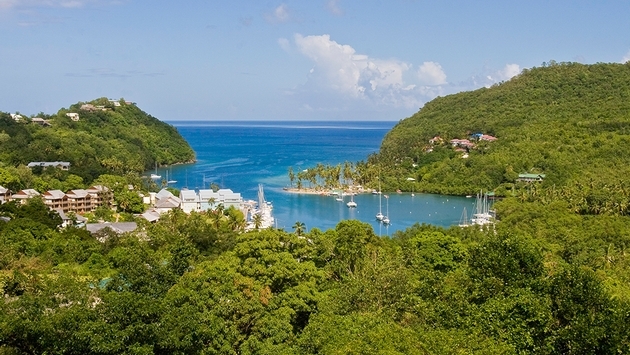 For more information about Saint Lucia, please visit http://stlucianow.com, call 1-888-4STLUCIA or become a fan on Facebook at www.facebook.com/SaintLuciaTouristBoard.